Argentina has lurched closer to becoming what could be described as a Fascist nation after “Peronist” president Cristina Fernández de Kirchner announced the nation’s intentions to nationalize the largest oil company in the country yesterday. Combined with rabble rousing rhetoric dredging up the impotent claim to the Falkland Islands, and a tightened control of the press, many fear leadership in Argentina has finally dropped all pretenses of a being democratic and free market nation, as they appear to be hurtling the nation towards populist policies which arguably wrecked the entire continent of Europe during WWII. Cristina’s party controls the government, so there is little hope that the bill to nationalize the oil company will fail in Congress. The move would mean the nationalization of YPF which is the largest oil and gas company in the resource rich nation. Over the past decade, experts have expressed concern about the viability of the nation’s industry as restrictions, regulations, and taxes (which have been implemented under the guise of redistributing wealth) have subsequently stifled any motivation to develop the country’s energy sources. Ironically, those selfsame regulations, taxes, and restrictions have largely been the cause of higher prices, and inefficiencies cited as justification for the government seizure of property. Despite being home to exceptional resources, the country has resorted in recent years to unilaterally ending energy exchanges with neighbors, as it has done with energy-poor Chile in the middle of winter. At the end of the 19th century, Argentina had been one of the richest nations in the world due to a prospering free market. Starting in 1945, the 10 year administration of Juan Perón began nationalizing industries and services which were previously run by private interests. the government took center stage, and controlled the previously natural impulses of the economy. Rampant inflation followed these fascist policies. Growth from the 1960s was undercut by the corrupt and disorganized economic policies during the military dictatorship from 1976 to 1983. In 2002, Argentina defaulted on its debt; no longer able to make interest payments. In 1991, Argentina privatized many government owned companies, and YPF was sold for US$3 billion during July of 1993. It remains to be seen how European governments react to the nation effectively confiscating the property of the citizens of foreign nations (58,23% is owned by the Spanish energy company). Stock shares of YPF SA dropped over 11% after the move was announced on Monday. There are very important differences between Perón and Kirchner. 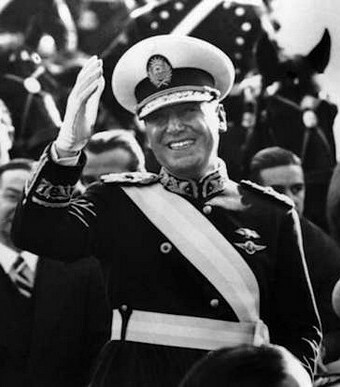 Perón spent like there was no tomorrow, whereas both of the Kirchners have stressed the need to control the fiscal deficit; you might call her a neo-populist, but she is not a classic populist. Perón was an authoritarian certainly, but Kirchner has not even come close to matching him in that department. You use loaded words such as populist, dictator, undemocratic, and fascist, but they in no way shed light on a complicated story. Whether or not words are “loaded” is subjective. The issue is whether or not they are accurate. Severe economic and social regimentation? Check. Forcible suppression of opposition? This has started through indirect control of press. While Argentina’s government may not yet be totally Fascist, that it is trending towards Fascism seems fairly clear. That Kirchner is not as Fascist or Dictatorial as Perón is irrelevant. If a house is simply partially on fire, or totally burns down, it is still a “house fire” in either case. Tell me this, what is democratic about controlling opposition press? What is not populist about seizing private pension funds for the “good of the nation?” What is not dictatorial about seizing a private (and mostly foreign) company? What is not Fascist about antagonizing the UK about the Falkland Islands as a way to drum up patriotism? That there are differences between Perón and Kirchner I will grant you, but those differences are becoming harder and harder to define. I would also use caution in describing CFK or even Peron for that matter, as fascist. CFK is a statist, demagogic fool, but she is more stridently leftist than Peron was, and has reversed Carlos Menem’s policy of immunity for the legitimately fascist generals who gave Argentina dictatorship and the infamous Dirty War. Peron never had much of a coherent ideology, he just liked to dole out cash (more in the spirit of buying loyalty than economic development. Kirchner is a German name, n’est-ce pas???? But her last name is Fernandez, and this is not German!